Thanks to our venerable president Kenny Cada, US Bank is supplying some much needed muscle to do demolition work upstairs in the depot this Saturday. Jim and his little band of elves must've been at work last weekend, because the ceilings are already down and the floors are piled high with lathe and plaster. This week, work resumes with the US Bank volunteers and others taking on the lathe and plaster walls. The work party begins at 9 am, lunch will be served, and there will also be a chance to do some outside gardening chores. The HPG will supply hard hats, safety glasses and respirators, and volunteers should bring leather gloves and wear thick-soled boots. The work teams will rotate with frequent breaks, so plan to have some fun along with the labor! On a related note, Larry Comer and Del Hatch were in town yesterday as part of kicking off a study of possibilities for the old mill site. The depot is a key part of that land and its future, so Larry and Del took copious notes to learn more about the WIM HPG, the depot and our plans. It was a very productive tour, with a fair amount of dreaming involved. Pie in the sky? Not really when you think of how much has been accomplished since the mill closed 30 years ago this year! 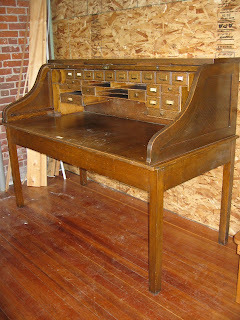 Dan Crandall brought the William Deary desk to the depot last Saturday. 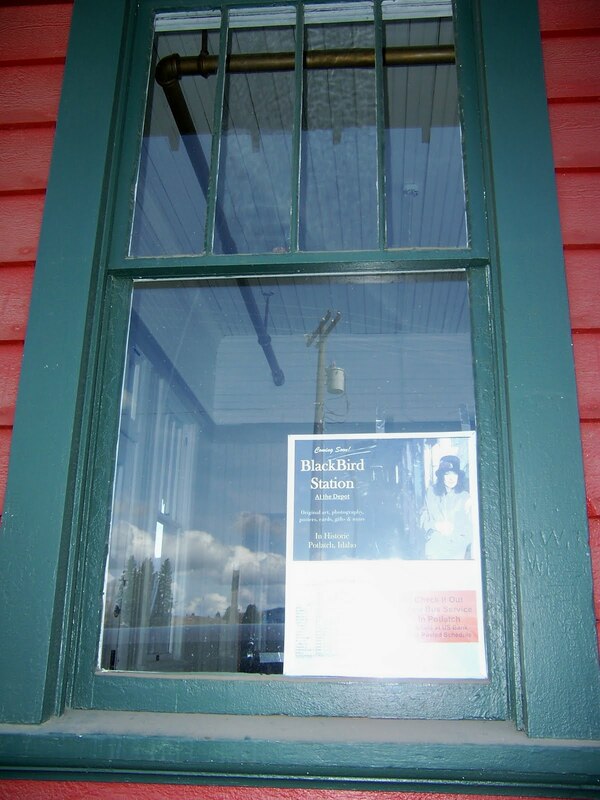 Dan is the Director of the Latah County Historical Society and a real fan of the depot project. For some time he has hoped to bring the desk back to town and he picked a day of pouring rain and cold to get the job done. Accompanied by his wife Marilyn, sister and brother-in-law, Linda and Ward Pletcher of Ferndale WA, son Aaron and grandson Perry, Dan toured his family through the depot and even enjoyed a look at the caboose. Marilyn was especially interested in being part of the demolition day scheduled for April 30. That's when the US Bank employees will volunteer some hours of community service, thanks to HPG President Kenny Cada, manager of the Potlatch branch of US Bank. Dan isn't exactly sure how the desk came to the LCHS headquarters and he didn't know whether the desk had been at the depot or maybe at an office in Moscow, but he knew it was Deary's desk. It is possible that the desk actually was in the depot back in the days of Deary's tenure. Dan assures us he will be looking into the background of the desk when he gets time and further information. 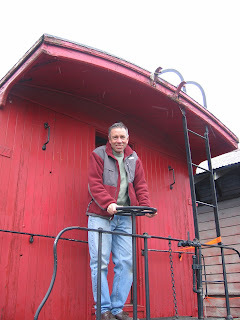 Dan Crandall and his family toured the caboose as part of delivering the William Deary desk to the depot last weekend. Meanwhile Paul "Poke" Montgomery called last week to say the lumber for the caboose is ready and will be brought to the annex when the weather clears up. Poke and his wife Jeanette are donating the lumber for the caboose, a very generous gift for the X5 and the HPG!